Scottish Ceilidh band for hire. Licence To Ceilidh are the perfect Band for any wedding ceilidh, Scottish ceilidh, corporate event, team-building day, Birthday party, private function or festival. Licence To Ceilidh specialise in Scottish ceilidh, but regularly play Irish and English as well. Established in 2000, they have many years of experience in teaching party guests how to dance the steps, and their unique mix of traditional tunes with a funky rhythm section gives the excitement of a function band with the inclusiveness of a Scottish ceilidh. No previous country dancing experience is necessary to take part and everyone can get involved whatever their age, musical taste or talents on the dancefloor. From the word go, it’s easy and a lot of fun. Their range of dances is very diverse, with influences from all over the UK, Ireland and North America. Their caller usually starts with the Gay Gordons or another simple dance like the Circassian Circle, and makes sure as many guests who are capable of standing get involved. After this initial icebreaker, it’s often difficult to get even the most reluctant punters to sit down again! Other dances include the famous Strip the Willow, a raucous affair with lines of people stretching all the way down the room, the Virginia Reel for four to five couples in a set, the Pat-A-Cake-Polka for those who like to slap the thighs of other guests as well as their own, the OXO Reel, the Cumberland Square Eight, Flying Scotsman, Canadian Barndance, Eightsome Reels and many more. A favourite with the gentlemen is the Dashing White Sergeant, in which a guy can dance with two ladies at once. And if you have a dance that you are particularly fond of, you can always request it in advance. 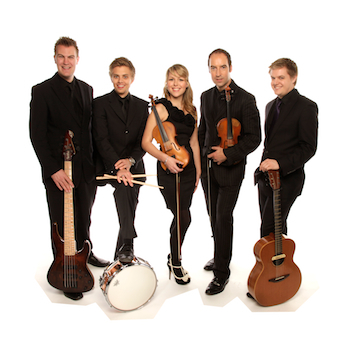 License To Ceilidh bring their own high quality P.A. and LED band lighting. All equipment is regularly PAT tested. Alyssa is Licence to Ceilidh’s main caller. Being from Inverness, the capital of the Scottish Highlands, Alyssa grew up surrounded by ceilidhs and Scottish music. She studied dance and theatre arts from a young age and trained at the prestigious Dance School of Scotland in Glasgow from the age of 16, gaining an A.T.C.L diploma in Musical Theatre from the Trinity College London. Alyssa was invited to audition for the first ever Andrew Lloyd Webber scholarship back in 2007 winning a place at the famous Arts Educational School in London, which she graduated from in 2010 with a BA Hons in Musical Theatre. Alyssa brings great fun and energy to the ceilidhs she calls as well as clear instruction. 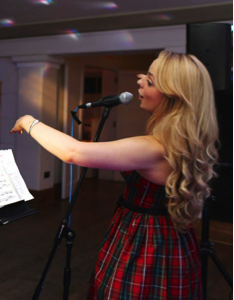 In addition to this she is also a fantastic vocalist singing with our pop Covers band option, as well as performing as a dancer with Licence to Ceilidh on corporate and party bookings! “I am writing to thank you for Licence to Ceilidh’s wonderful performance in this year’s Windsor Festival. “The party was a hit from start to finish. The organisation was impeccable and the calling professional and concise. To have such young and incredibly talented, thoroughly glossy musicians hosting the evening was a real treat! “Phenomenal New ‘Trad’ Band… Licence to Ceilidh features five absolutely phenomenal musicians, all classically trained, but totally dedicated to Irish traditional music. Recently featured on BBC Radio 3, they blasted the airwaves with their fast and furious driving rhythms and invigorating foot stomping tunes. “Thank you to License to Ceilidh for such great music at our party. I had a ball and everybody commented on the fantastic music and Ceilidh. The bodhran was a great idea and worked very well. “I didn’t hear it myself, but my sister informs me Jim said it was one of the best dressed barn dances he had been to so we are very proud of that accolade!! It seemed a natural choice to have a ceilidh for our wedding, as all the best wedding receptions we have been to involve much swirling around the dance floor to the sound of fiddles and flutes. We were keen to find a band who were modern and who could be adaptable to our ‘crowd’, as although a number of guests were Scottish, we didn’t think we could necessarily rely on everyone knowing the dances. We booked Licence to Ceilidh directly after hearing them play at the foyer of the Royal Festival Hall. Their music was fantastic and when some members of the audience spontaneously got to their feet to dance we were convinced. The band set up in a professional and unassuming way and also helped us with our post-band disco so that the whole evening went smoothly. Their set was upbeat and inclusive and soon had all guests – both young and old – joining in. The calling was great and more than sympathetic to the fact that most guests (bride and groom included) were not accomplished Ceilidh dancers. It did not take long for everybody to relax and join in. The band were a key part to a memorable wedding day.